Your next stockbroker might just be a computer. Last spring, wealth management firm Charles Schwab launched a new service called Schwab Intelligent Portfolios. The service is unique in that it's not a person who decides where to invest your money, it's an algorithm - lines of code programmed into a computer. "It's lower cost for the investor," says Tobin McDaniel, who leads the Schwab Intelligent Portfolios team. "As opposed to working with a traditional advisor where you might pay up to 1%, here you get portfolio management at essentially no management fee." To get started with Schwab Intelligent Portfolios, you answer a short questionnaire aimed at determining your appetite for risk and your investment goals. Algorithms then create a portfolio suited to your profile and manage it on a daily basis. Instead of simply crunching numbers, the machines are now making decisions. And that increasingly describes the rest of the financial system. Machines are now responsible for most of the activity on Wall Street. And just this summer, the Chicago Mercantile Exchange Group closed most of its trading pits after 167 years. The practice of traders shouting and using hand signals to buy and sell commodities had become outdated. The work they once did has been replaced by a much quieter competitor - the computer. Brad Bailey is a research director at Celent, and an expert on electronic trading. "Now when you think about trading, things are happening in nanoseconds, or certainly milliseconds." Supporters say computers boost liquidity, helping would-be buyers and sellers find one another without middlemen. Then there are the high frequency traders. They zip in and out of shares so quickly, and on such a massive scale, that their fortunes are lost and made by tiny price movements. Other algorithms rely more on artificial intelligence to pour over earnings statements, news reports and regulatory filings looking for clues on how to view a stock. While these lines of code are faster and more efficient than people, Brad Bailey warns that "[a] lot can happen in those time frames before humans can react". In 2012 US market maker Knight Capital lost over $400m (£261m) in 30 minutes because of a computer glitch. 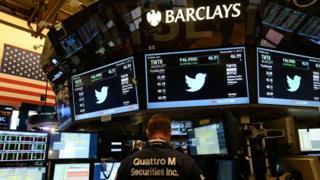 And this summer trading was halted at the New York Stock Exchange following a software problem. These events have raised doubts about the stability of computerised trading systems. Critics argue it has made markets more volatile. And what about trading rules? Are they fit for purpose with markets that now handle orders in milliseconds? "We live in a world where you can't prevent every problem," says Ron Geffner, a former Securities and Exchange Commission attorney who now works with hedge funds. "It takes time for regulators to spot the problems, become aware of it, and once they become aware of it to adopt rules." To prevent big swings, US financial regulators have implemented a raft of measures including single stock circuit breakers. The rule requires a pause in trading for individual stocks if the price moves 10% or more in a five-minute period. And companies like Charles Schwab have also instituted safeguards. Just this August, when the Dow fell more than 1,000 points during the trading session, Charles Schwab convened a panel of people to check if the huge volume of orders its Schwab Intelligent Portfolios was about to place was the right move. Todd McDaniel tells the BBC: "We've got a human checkpoint". People still have a role in the financial system but it's changing. On Wall Street at least, it's a machine's world.